JCK, the umbrella brand for JCK Events’ LUXURY and JCK shows; and the AGTA Show were held at the Mandalay Bay Resort and Casino in Las Vegas from May 26 to June 1. Luxury opened first with three invitation-only preview days. AGTA began May 28 and JCK followed on May 29. Housed on three floors of Mandalay Bay, JCK is the largest jewellery trade show in North America. Vendors come from around the world as do retail jewellers and others in the trade. It is where buyers come to find the newest styles for fall and winter and to network with colleagues. This year the “JCK Talks” series also provided great learning experiences for the many who attended. Over 2,300 vendors welcomed 22,000 retail buyers representing 9,400 stores. According to JCK Events staff, attendance was up 4 percent over last year. To mark the fifth anniversary of being at Mandalay Bay, show organisers made many changes to improve the show’s sprawling layout, the most noticeable of which were the visual redesign and the establishment of merchandised neighbourhoods. A new educational program, “JCK Talks,” was inaugurated this year to the delight of the many that were able to attend. Topics included “What’s Next With Wearables,” a panel discussion about these increasingly popular devices and possible jewellery applications; and “The Best of the Best,” a presentation of the best strategies by top retail experts. “The Power of Blogging” and Diamond Insights” also were inspiring. For relaxation and opportunities to see old friends, the new Wine(d) Down bar was the place to be at the close of each day. Of course, it was all about the jewellery for the buyers. There were many trends noted but seven that stood out included Ethiopian opals, “green” and organic jewellery, cuffs, stunning colour combinations, stackables and a prediction by Le Vian that peach morganite™ will be the colour for 2016. As we noted in our summer issue of CIJ Trends & Colours, the use of Ethiopian opals in jewellery is on the rise, and it’s no wonder when one sees the beautiful play of colour in these stones. It is hard to miss them. 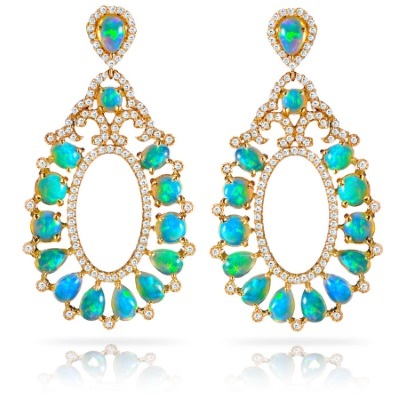 One example can be seen in these earrings of 7.52 ctw of Ethiopian opals combined with 1.85 ctw of diamonds and set in 18K gold by Haridra New York. Recycled gold and sterling silver were featured by at least two of the designers found in the Design Center. 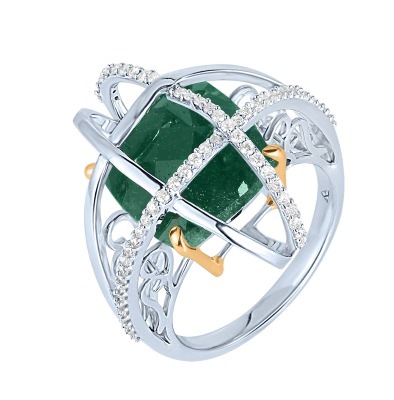 Priyanka Murthy, of Arya Esha, a Rising Star designer and winner of the Editors’ Choice award for jewellery design in 2015 featured this ring of 11.73 ctw of green aventurine with .54 ctw of diamonds set in recycled sterling silver and accented with 18K yellow gold. The ring is part of her Galaxy Collection. Known for the movement in her pieces, Gina Pankowski also utilizes recycled sterling silver and gold in her jewellery. 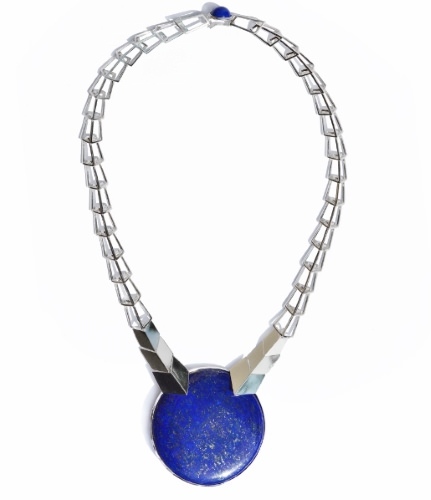 Shown here is a recycled sterling silver necklace with a natural lapis lazuli pendant. 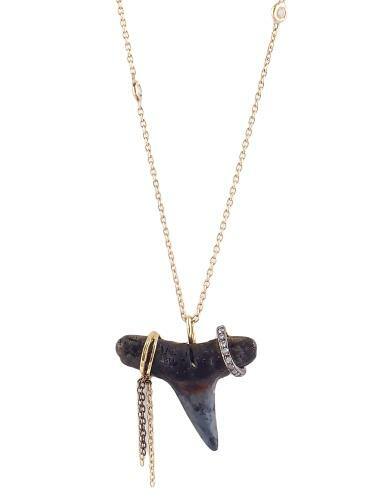 In the “Organics” arena, this shark’s tooth pendant is enhanced with 14K gold and diamonds on a 14K gold chain, by Harika. Cuffs continue to be shown in a variety of styles. 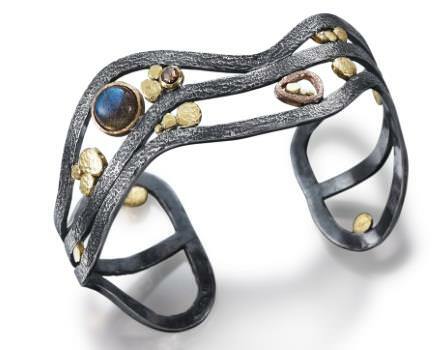 One that caught our eye was this Open Wave Cuff bracelet by Rona Fisher. The cuff is hand-forged black sterling silver and 18K rose and yellow gold. River pebbles offset an 8mm labradorite from Madagascar and a 0.11ct natural rose-cut cognac diamond. Even though there were lots of softer hues visible, stunning colour combinations were also popular. 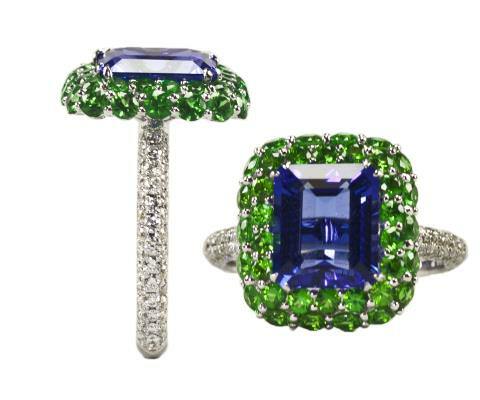 Caroline Chartouni of Caroline C, a 2015 Spectrum Awards winner, designed the 18K gold ring featuring a tanzanite surrounded by tsavorite and diamonds seen here. 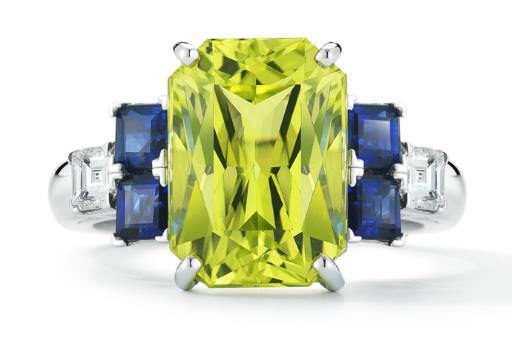 An eye-popper from Oscar Heyman was this chrysoberyl, sapphire and diamond ring set in platinum. 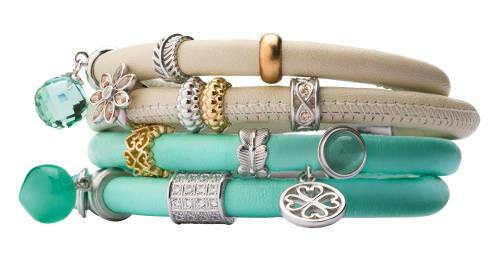 Stackables in all sizes and descriptions continue to trend as well. Endless was offering these leather stackable bracelets. Buyers have a wide choice of colours and over 600 charms from which to choose when creating their bracelets. 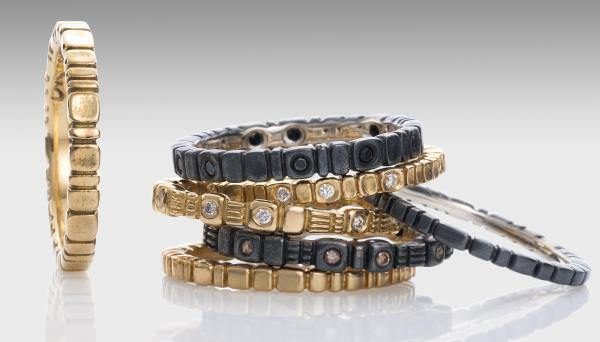 Conni Maine was showing her 18K gold Platinaire® pavers that can be worn singly or stacked as high as the buyer wishes. Sandra Biachi Fine Jewelry offers stackables for every lifestyle in 14K or 18K gold or platinum in a choice of white, yellow or rose colour. Le Vian has declared Peach Morganite™ the colour of the year for 2016. 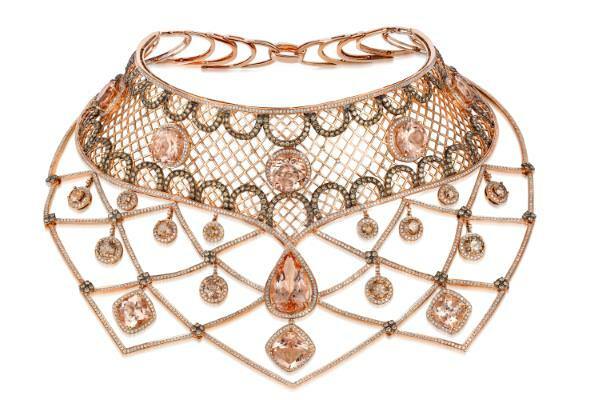 Included in its new line of jewellery spotlighting this stone is this Le Vian Couture®, 18K Strawberry Gold®, Lacy Fishnet™ collar with 55.42 ctw peach morganite and 26.8 ctw Chocolate Diamonds® and Vanilla Diamonds®. Not surprisingly, this piece won a 2015 JCK Jewelry Choice Award. The year 2015 got off to a soft start in the jewellery industry. Some of the early shows yielded disappointing results; and retailers, largely due to the severe winter in parts of the US, also reported less-than-stellar sales. However, business was strong for many at the show. The buzz is that things are on the upswing and most in the industry are looking forward to a better second half of the year. The 2016 show will be June 3 to June 6.